Quilters have stored their treasures in boxes, under beds, draped over couches, hanging on walls, and a whole slew of various storage containers. In the early days of quilting, primitive furniture like this Doughbox were used to hold many different items – even quilts! 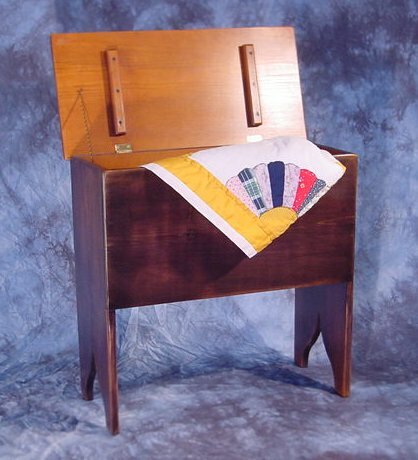 This primitive dough-box is ideally sized as a stand alone accent or as a chair-side table to house several quilts, sewing supplies or magazines and newspapers. Available in natural wood tones or stain-painted wash tones, this piece measures 25″L x 12″D x 24″H. This piece comes from a fantastic woodworker in lower Michigan with a long history of woodworking skills passed down from one generation to another. You can see more of his work at his website, Mosey’s Woodworks. Hmmm. Nice name, that woodworker!